Costs – With its wide variety of trees needing care, Albany homeowners need to be aware of the average cost of tree care and maintenance so they don’t pay more than necessary to keep their tall flora in top shape. FAQs – Upstate New York has many different types of trees, with different types that flourish or perish depending on the seasons what bugs might be coming through the area. Know what to be aware of and what types to plant during the different seasons. Services – See our list of tree maintenance professionals in the Albany area so you know who to call when it’s time. How Much Do Tree Services Cost in Albany? Located in Upstate New York on the banks of the Hudson River, Albany is a scenic city that boasts all kinds of wildlife. To keep your own small part of the city looking great, you might want to think about hiring professionals for jobs like tree trimming, stump removal and tree removal. Read below to find out what to expect when it comes to tree service costs in Albany, New York. How Much Does Tree Removal Cost in Albany? There are a number of reasons why homeowners might need to remove an entire tree from their property. Dying or dead trees can be a safety hazard, and they can also be unsightly. If you are planning new construction, trees might need to be removed to clear a space for an addition or a new building. Whatever the reason, professionals can safely remove the tree and even haul the wood away on the same day. In Albany, the average cost of tree removal ranges from $444 to $606, but the exact price will largely depend on the size of the tree. How Much is Stump Removal? Completely removing a stump from your property isn’t easy, but the job gets done quickly with a commercial grinder. To save yourself the time and labor, bring in a professional and expect to pay between $83 and $143 to remove a single tree stump. Trimming a tree can help it grow properly, and cutting the branches is a smart way to prevent trees from encroaching on your home or a nearby power line. Pruning, while similar, is generally reserved for fruit trees. Whatever type of tree maintenance you need to have done, expect to pay around $458 for the service. Living in Albany brings with it a number of perks, and just one is that you get to enjoy beautiful scenery right at your door. Use this guide to learn more about native trees in the area, growing fruit in Albany, tree removal regulations and what limitations overhead power lines might create. The City of Albany goes to great lengths to preserve old, historic and grand trees in public places. However, individuals may choose to remove any trees on their own property at any time. As long as the tree is entirely on your property, no permission or permit is required. 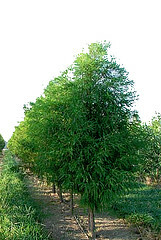 If you are planting new trees, however, the Forestry Department will pay for half the cost of any new tree you plant in the front or along the side of your home. National Grid, who runs and maintains the overhead power lines in the city, recommends that you familiarize yourself with the nearby distribution lines and transmission lines in your area before planting any new trees. Taller trees can pose a threat to your electricity in the future, so they should be planted at least 40 feet away from the power lines. Branches that are growing toward or near power lines may be trimmed by professional teams, but homeowners will sign a waiver authorizing this before it takes place. 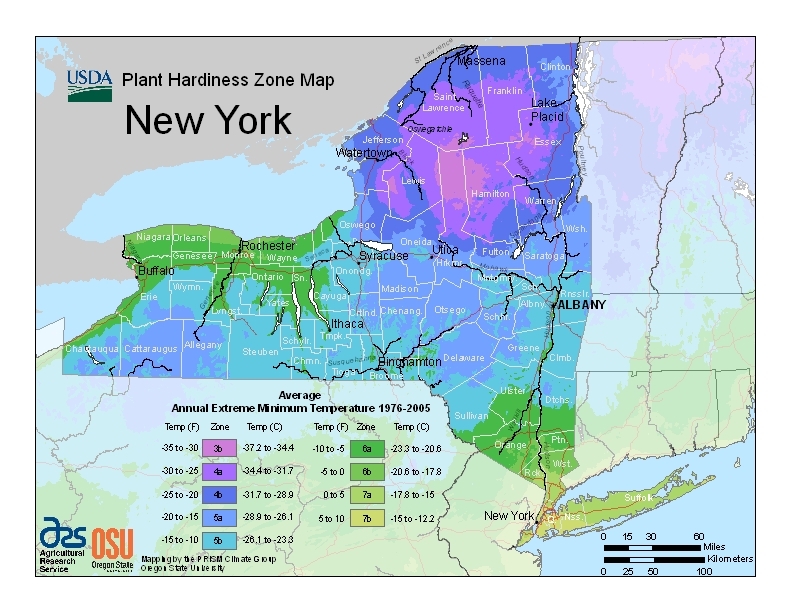 Despite cold winter temperatures, it is still possible to grow a range of fruits in Albany and much of Upstate New York. Choosing hardy versions of popular stone fruits like plums and nectarines is a great place to start, but apples and pears also thrive in this environment. Fruit trees will need to be placed in direct sunlight in order to bear fruit, so keep that in mind when planting. Albany experiences freezing temperatures daily for up to six months of the year, which means trees that can’t tolerate frost won’t be able to grow well outdoors in this environment. Tropical trees and palm trees may be attractive, but they can generally only be grown in nurseries and are not worth planting on your property. The New York State Department of Environmental Conservation warns property owners about some of the most common problems that might be encountered when growing trees in the state. Unfortunately, smaller pests have invaded Upstate New York; you will want to watch for signs of the gypsy moth, the emerald ash borer, the Asian long-horned beetle and the tent caterpillar. In addition, diseases and fungi like oak wilt and rust spot are common problems that crop up in the area. Acer Saccharum, better known as the sugar maple, has been the state tree of New York since 1956. 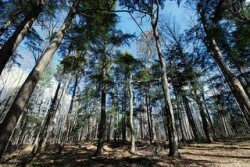 The tree is commonly found throughout the Northeast, and you can find hundreds in Albany alone. During the summer, the Sugar Maple is verdant and lush, and in autumn, the large canopies turn brilliant colors of orange, yellow, red and gold. Like most states, New York tracks the largest trees in the state through the Department of Environmental Conservation’s Big Tree Register. Albany makes it onto the list with a bald cypress that stands at 82 feet in height, but the tallest tree in New York is the 152-foot white pine in Warren County. Deals: Ask about winter specials!